The science team is working on incorporating data from the Hyper Suprime-Cam (HSC) survey into Comet Hunters. 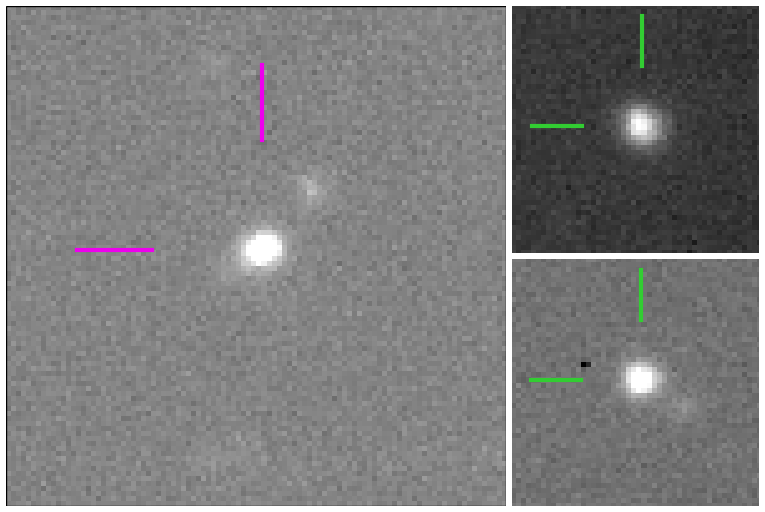 We started with the archival Suprime-Cam data first to get a better understanding of what are the false positives and challenges for identifying Main-Belt Comets (MBCs) in data from 8-10-m class telescopes. We’ll continue with both datasets as there’s more Suprime-Cam asteroids, but when we have the chance we’ll move to reviewing the new HSC observations hopefully a few days after they’re taken.Most previous asteroid detection surveys are using 1-3-m class telescopes, so there are bound to be surprises that we wanted to know about before we developed the decision tree for the HSC snapshots on to the site. 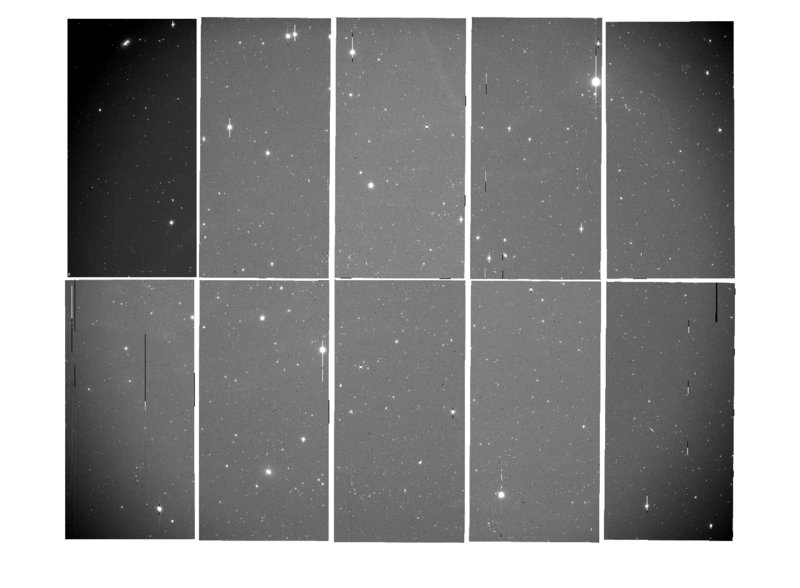 So we launched Comet Hunters with the archival Suprime-Cam images first. Now that things are going smoothly, we can turn our attention to the HSC data. We combined your classifications from the first batch of Suprime-Cam images and had 125 candidates in need of further vetting. 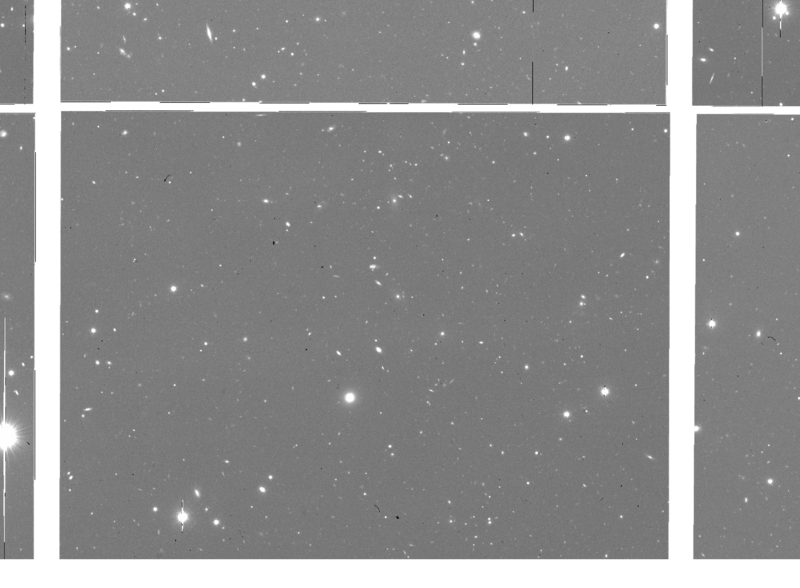 Thanks to volunteer Tadeáš Cernohous who on Talk went through our list comparing repeat images of the asteroid at slightly different positions in the same batch of subjects. What we learned that all of the candidates are unfortunately blends with stationary background sources. There are lots of faint background blobs that the asteroid moves on top of overlapping in the images creating very tail-like features. All of these images the science team would have had said has a tail. Looks like a candidate tail, but a blend with a background source. We’d want this marked as ‘has a tail’ in the classification interface. There’s a lot more blends than we had anticipated given some of the team’s past experience with 2-m asteroid survey data. It’s still very much worth digging into the rest of the Suprime-Cam archive to look for MBCs. There might be many blends, but there could still be undiscovered MBCs too! Knowing that the background blends rate is much higher because of the increase in the photon collecting bucket is extremely useful. From the candidates, we could see the blends are faint blobby structures that would be likely hard to get a source extractor to pick up in all cases. Because of the quality of the HSC data and the repeat observation cadence we can try and take this into account possibly by checking the image of the asteroid and the repeat image of the same position take later on in the same night (not all Suprime-Cam images will have that and are taken in all types of sky conditions). Now the Comet Hunters team is thinking about how best to develop a classification interface for the HSC data to include this. In the meantime, there are new Suprime-Cam images in need of review at http://www.comethunters.org if you have a minute or two to spare. You might have noticed the blue banner currently on the Comet Hunters website. That’s because thanks to your help, we’ve completed the classifications needed to retire all the images that were live on the site. The team has been working to process a new batch of asteroid images. We’ve taken our time to improve on some of the data reduction issues you might have noticed in the launch images (streaked asteroids, more off center asteroids images, and some bad quality images). By having people spot and comment on these features in the images, we’ve been able to refine the data processing pipeline for this next batch of images. We will have those images live ASAP. Stay tuned to this space. Most of the Comet Hunters science team chatted today, and we’ve decided to put on Talk our top comet candidates based on your classifications. 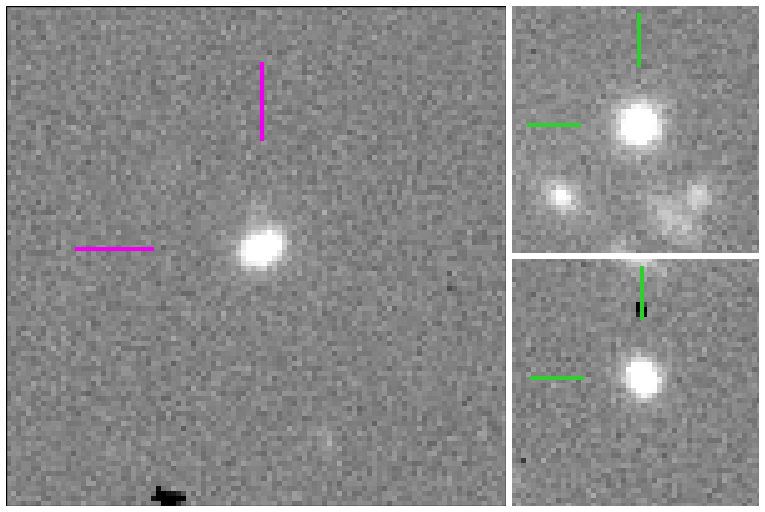 As we’ve found thanks to your classifications and Talk comments, overlaps with background sources are a huge source of false positives for 8-m class telescope images of asteroids when you’re searching for comet-like tails. 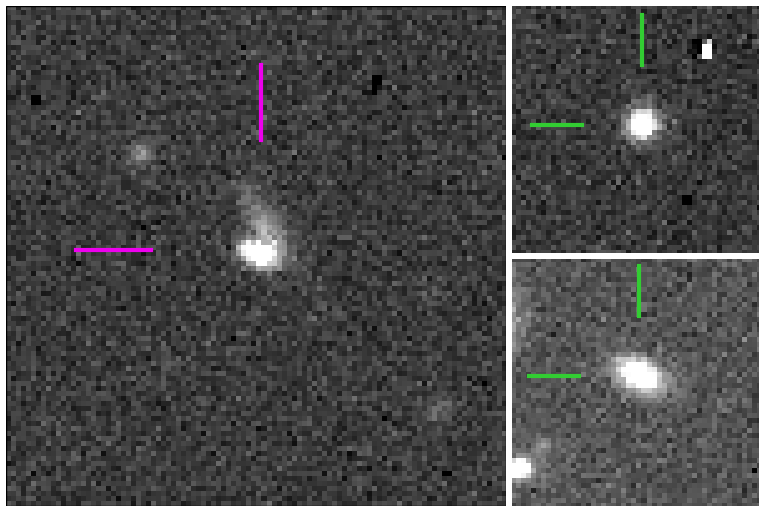 If you’re interested, we could use your help to review other images to see if the potential tail is a background galaxy or star when you view the same area after the asteroid has moved. More details here. Today, I thought I’d give you a different view of the camera and images that you currently see on Comet Hunters. Right now we’re showing archival images of asteroids from the Subaru Telescope with Suprime-Cam. Suprime-Cam can image a 0.25 of a square degree patch of sky in a single observation, that’s a bit bigger than the size of the full moon as viewed from Earth. Until a few years ago with the first light of its successor instrument, Hyper-Suprime-Cam, Suprime-Cam reigned as the largest field-of-view camera on the 8-10-m class telescopes,currently the largest ground-based telescopes. Suprime-Cam is an 80-mega pixel camera weighing in at 650 pounds and located at the prime focus of the Subaru Telescope. You can learn about the camera first light and commissioning here and about the upgrade of the camera is 2008 here. 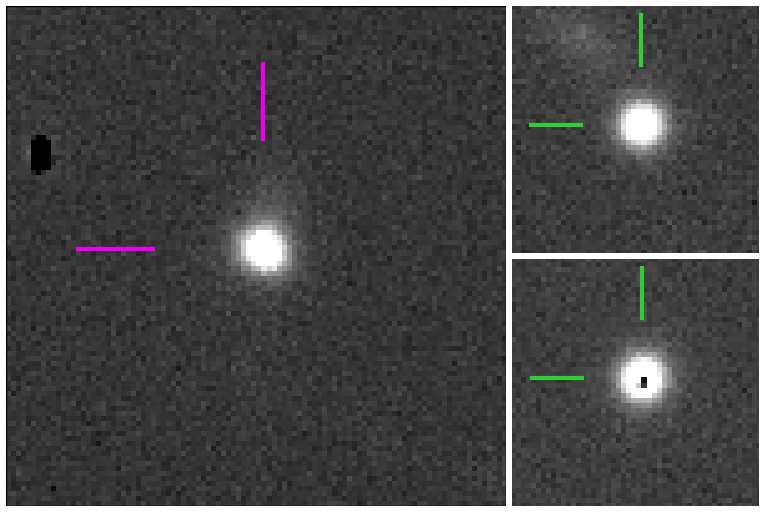 We show a much more zoomed in image on Comet Hunters focused very close around the asteroid and reference stars. The images that we show on Comet Hunters come form the Subaru Telescope and currently the Suprime-Cam wide-field imager, which Charles described in the last blog post. We are using images primarily taken for other purposes that serendipitously have known asteroids in the images. Since most of the science cases that prompted those observations were likely about other things outside our the Solar System, most of these asteroids have gone unnoticed and never been looked at for cometary activity. Subaru is mostly a classical observing telescope, which means you apply for time on the telescope and if the Time Allocation Committee (TAC) awards your proposal time on the telescope you have to go to Hawaii or to a remote observing station and take the observations. Of course this is not completely on your own you have help from the telescope operator who’s job it is to run and drive the telescope. On my observing runs at Subaru there has also been an observatory staff scientist who is an expert on Suprime-Cam there for additional support. It is the visiting astronomers’ jobs to decide where the telescope is pointing, how long the camera should be imaging, and what filter should be on the imager. The visiting astronomers are also checking the image quality and determining if it is good enough for their science requirements. If it isn’t they can ask for the telescope to be refocused to try and improve the crispness of the stars in image (or the size and shape of the point spread function). Although there are remote observing stations in Japan and in Hilo, Hawaii most observations are taken at the telescope. Well in reality right next door to the telescope near the top of Mauna Kea. Telescope is housed in one building with the telescope control room in the building next door connected by a tunnel. Mauna Kea reaches 14,000 feet above sea level where it is possible to get altitude sickness, which can be very serious. Observers from the summit are barred from deep sea diving right afterwards and vice versa because it would cause ‘the bends’ or decompression sickness. You can definitely feel the lack of oxygen and the dryness of the air when observing there. I was eating a sandwich once while observing on Subaru, and a glitch happened with the camera. I put my sandwich down to help deal with the issue and make sure we were imaging the observation that screwed up after we power-cycled (aka rebooted) the Suprime-Cam. It took about 20 minutes until everything was back running smoothly. By the time I got back to my computer and my night lunch, the bread had given all its water to the air and was stale! At such high altitudes, there is actually a rule that anyone working at the summit of Mauna Kea cannot stay up longer there longer than 14 hours, before they need to descend to mid-altitude for safety and health precautions. The astronomers, operators, and observatory support staff working on the telescopes at Mauna Kea sleep at the mid-altitude site known as Hale Pohaku (which means ‘stone house’ in Hawaiian), dubbed HP for short by many. Shortly before sunset, the night crews and visiting observers drive up to the telescopes at the summit. At sunrise, or shortly after depending on what wavelength you are observing in, the domes empty out and people descend to mid-altitude for sleep and maybe breakfast. The day crews take over with the engineers and observatory staff scientists perform maintenance, test the telescope and instruments, and prepare the observatory for the next night of observing. One of the moments I look forward to after a few nights observing on Mauna Kea is coming down after a good night of observing to HP and having a warm breakfast while tired and groggy before trying to catch some sleep before the start of the the next night. Mauna Kea is one of the best astronomical observing sites in the world, and I would say every observational astronomer dreams of one day observing with the telescopes there. We’re all grateful for the privilege and opportunity to use these telescopes on such a special place in the world. In a way, with Comet Hunters we’re extending the scientific legacy of the Subaru Telescope and these observations by searching them for new main-belt comets that might have been hiding in plain sight. 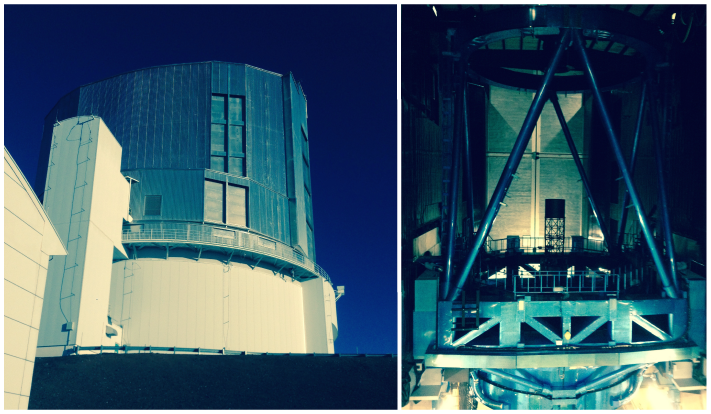 I’ll leave you with some photos below of Subaru and Mauna Kea from my fairly cloudy observing run this past June. Building the Subaru Telescope is housed in. The building on the white building on the right that is partially in the frame is where the control room is. The images you see on Comet Hunters come from the public archive images from the Subaru Telescope. Subaru is the first 8.2-meter class telescope in the world, built at 1998. It is equipped with a single mirror (8.2-meters is the largest size that currently is able to ground with precision into an astronomical mirror). The telescope is located on one of the best observing sites in the word,on the big island of Hawaii near the summit of Mauna Kea. Subaru is also the only 8.2-meter class which was constructed by a single government (Japan). The name for the telescope is the Japanese word for the Pleiades star cluster (sometimes referred to as the 7 sisters). 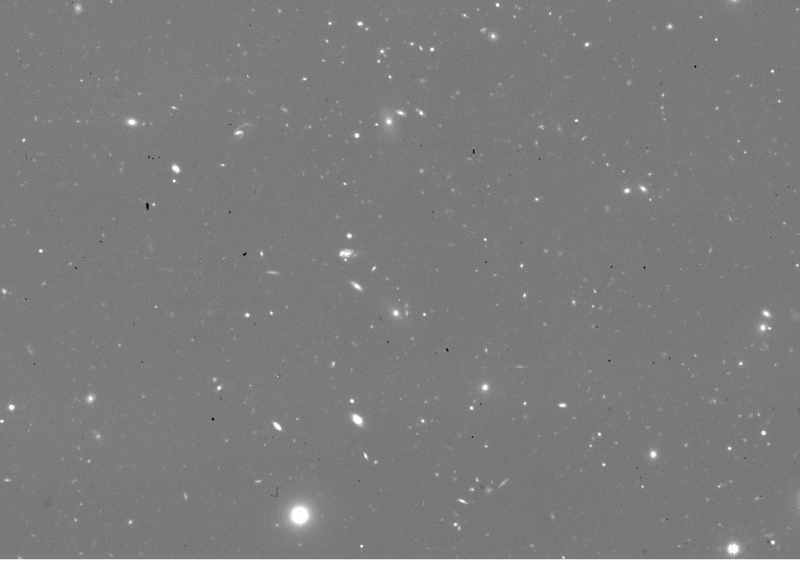 The images we serve on the site come specifically from the Suprime-Cam which is located at prime focus of the telescope. It has a 34′ x 27′ field of view on the sky with a pixel scale of 0.20”. We use are using the publicly available observations for the telescope which you can peruse further on your here. Although it is 17 year old, Subaru is still one of the most powerful telescopes, by continuing to update its suite of instruments. In 2014, Subaru announced the open-use of Hyper Suprime-Cam (HSC) which is a very wide field camera with 10x field of view of old Suprime-Cam. HSC is at preset the world’s largest field-of-view camera on a 8-10-m class telescope (the largest collecting area optical telescopes we have to date). We are planning to incorporate HSC data into Comet Hunters in the near future. Asteroids and comets are small bodies (several hundred miles across, or less) leftover after the construction of our Solar System’s planets. Asteroids are commonly assumed to be mostly rocky or metallic with the majority orbiting between Mars and Jupiter. Comets on the other hand are a mixture of rock, dust, and ice with orbits more very elongated or hyperbolic orbits that typically originating from the outer Solar System and Oort Cloud (reservoir for long period comets) As a result of their icy composition, when comets come close to the Sun and get hotter, they become “active” as their ice sublimates (changes from solid to gas), releasing gas and dust, creating the distinctive fuzzy halo (known as a coma) and tails that we associate with comets. 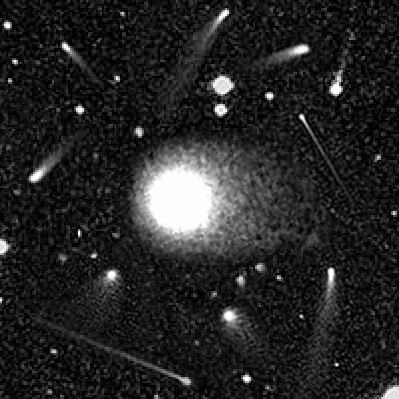 The assumed separation between comets and asteroids was seriously challenged in 2006 with the discovery of main-belt comets (MBCs), which have orbits in the main asteroid belt but have been observed showing cometary activity. Most of the MBCs known today were discovered by telescopes dedicated to surveying the night sky, which so far has been the most efficient way to discover these extremely rare objects. Unfortunately, these dedicated telescopes are rather small (less than 2 meters, or 6 feet, across). Much larger telescopes are available, but these are typically used by individual astronomers to conduct specific observations, and are not used for general surveys. 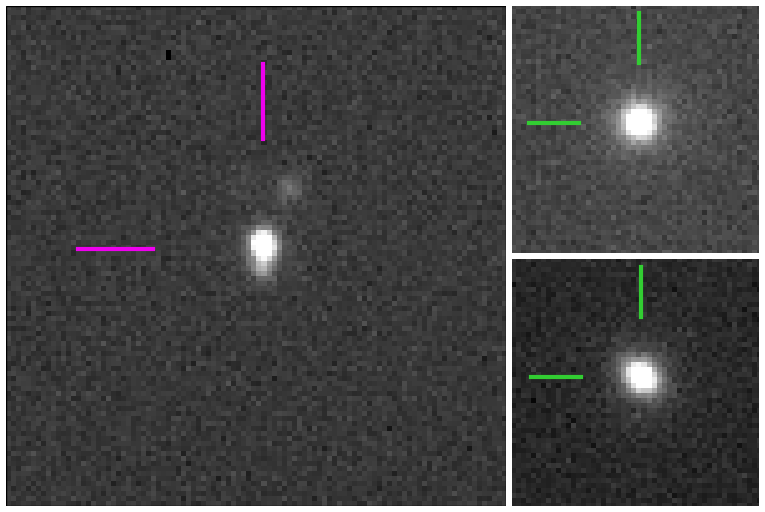 However, the images taken by these telescopes is archived and later made publicly available after a certain amount of time (typically one year), and it turns out that we can re-purpose these observations to search for active asteroids. Asteroids frequently appear by chance in astronomical observations of other targets (such as stars or galaxies). By compiling accidental, or “serendipitous”, observations of asteroids in archival observations of other targets, we can effectively conduct a “survey” of public data archives using much larger telescopes than are currently available for dedicated all-sky surveys. This is important because we believe that we should be able to discover many more active asteroids if we can detect fainter activity, and the way to detect fainter activity is to use larger telescopes. Detecting activity itself is not easy, however. Comets can have a wide variety of appearances, and while computer algorithms can be designed to detect some comets, it is difficult to design an automated system to detect all the different types of comets that might exist. In contrast, the human eye is much more flexible in terms of spotting different combinations and levels of “fuzziness” and tails that could indicate cometary activity. For Comet Hunters, we have extracted images of known main-belt asteroids from the archives of the Subaru Telescope, one of the largest telescopes in the world (at 8.2 meters, or 27 feet, across), located on Mauna Kea in Hawaii, one of the best astronomical observing sites in the world. None of the objects we are targeting have been previously known to show activity, but most have so far only previously been studied using small telescopes that may have missed faint activity. By going through and classifying the images on this website, you will help us identify candidates for new comets that we will then analyze in detail and possibly re-observe with follow-up observations to confirm the activity. If we can confirm a comet candidate is real, you will have helped discover a new comet! You will also have helped us along the way to our goal of greatly increasing the number of known active asteroids, and in doing so, contributing to the progress of this new and exciting field of astronomy.